Beauty was the order of the day, beginning with the spectacle that spread out on the old battleground that shoulders up against the city of Québec. 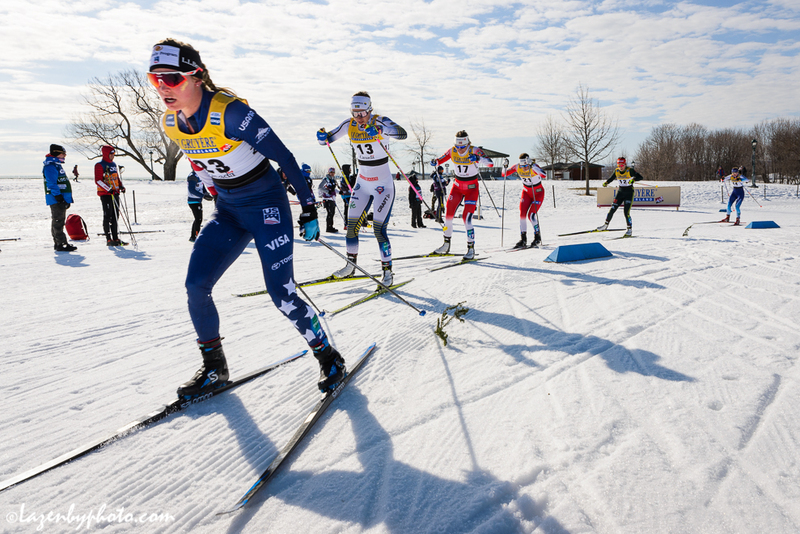 Nordic skiing usually proceeds against a backdrop of pine and birch, but there’s an undeniable thrill to see a race unfold beneath a bright blue sky, the action painted on a backdrop of buildings and streets. From the bottom of the one steep drop, one looked up to see the charging silhouettes of skiers as they crested the hill and began the plunge: pure aesthetic thrill. The women’s race that began the day featured an almost courtly beauty: Stina Nilsson beginning the pursuit with a sizeable gap that never seemed in great danger, even as Therese Johaug and Ingvild Ostberg teamed up to charge from behind. 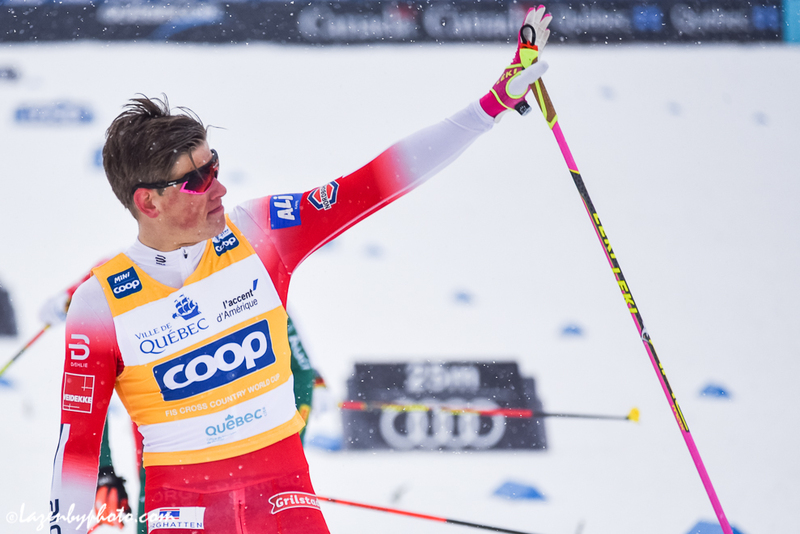 Johaug’s windshield-wiper tempo might have carried the day on softer snow or a longer course, but this was ten kilometers of hard-packed speed, and she couldn’t shake even her compact and unflappable teammate, who knew that she needed to claim her season’s title with a certain dignity. 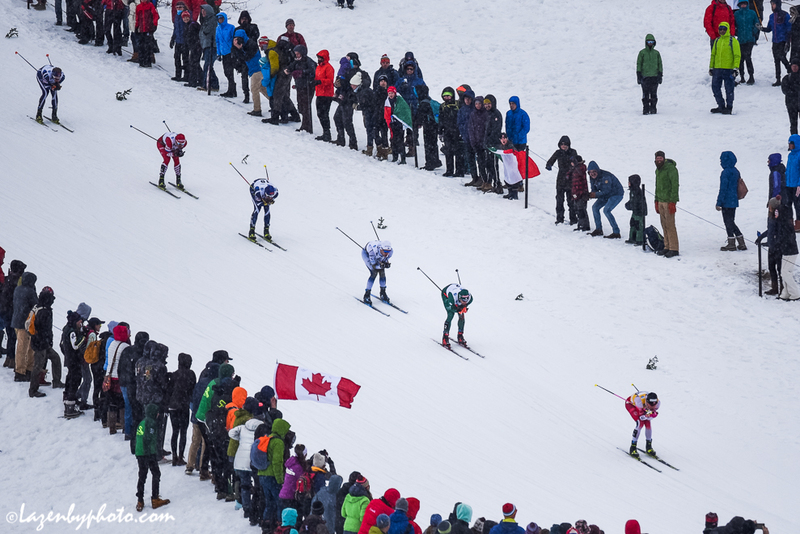 They were all regal, and the race was full of the promise of an interesting year ahead—and Jessie Diggins scorching ride up through the pack was the perfect note on which to end a brave but imperfect year. But the women—who have provided many of the year’s great moments—were the scene setter today. The season ended with the men’s 15k, and that featured charm of a different order. First was the emotional beauty of Alex Harvey. How could he have anything left after the happy tears of the day before? A tour of the course would have sufficed for his fans, but instead he demonstrated the kind of tenacity that harkened back to champions like Ulvang: Alexander Bolshunov, the perfect foil, started just a second in front of him, and Harvey never let the gap widen—for 15k they were within arm’s length, and indeed on the drops the Canadian would often reach out to grab the basket of his Russian foe. Harvey worked the course like the savvy skier he is, finding every rest that an aging body could benefit from. And then, in the stretch, he summoned all that he had saved–just when it seemed too much to ask for, Harvey swept by again: he had no real business outsprinting Bolshunov, not given the statistics of the season—but statistics are secondary for a reason, unable to capture what makes great athletes great. And never more so than with Johannes Høsflot Klæbo, who had the day’s most singularly exquisite moment. Having started nearly a minute ahead of Harvey and Bolshunov, he eventually took his foot off the gas and let them join his company for the final circuit of the course. He lurked just behind them, everyone conscious that if Bolshunov indeed could hold him off then perhaps the crystal globe would fall through Klæbo’s pink-gloved hands. If anyone was worried, though, it was for nothing. On the final hill, with the many thousands of spectators able to watch from every corner of the course, Klaebo swung wide to the right, contemptuous of the extra ground he’d need to cover. And then, in the course of fifteen seconds, he passed both men as if they were first-time skiers trying out the skin skis in the shadow of the lodge—by the hilltop, as he turned for home, the gap was so huge that he could look back and watch the battle behind. The sparky beauty of that move—and the deadly insouciance with which he made it—was the loveliest moment of a lovely weekend, and maybe of an entire long and lovely season. It recalled Northug at his fastest, but it came with none of the manic passion that his Norwegian forebear always seemed to channel. No, Klaebo was absolutely elegant, his move almost quiet and utterly inevitable. It cost Bolshunov a chance at a globe, and assuming Klæbo can summon it in the years ahead it’s hard to see how anyone will come that close again. Bill McKibben is a founder of the environmental group 350.org, and the author of, among many other books, Long Distance: A Year of Living Strenuously about his adventures as a slow cross-country ski racer.